Hat jemand den Eindruck bekommen, dass ich mit einem Zauberstab in der Küche stehe und mir einfach jedes Rezept gelingt? Tja, leider ist dieser Eindruck falsch. Hinter den Kulissen geht oft was schief. Wenn ich es auch manchmal schaffe, etwas aus dem Ärmel zu schütteln, die meisten Rezepte erfordern viel Zeit und Geduld. Wenn es dann einige misslungene Kuchen später klappt, wird ein schönes Foto gemacht und alles sieht perfekt und kinderleicht aus. Eine glatte wenn auch unbeabsichtigte Lüge eigentlich. Aber so ist es ja nicht nur hier auf diesem Blog. So ist es ja mit jedem Projekt, das entsteht. Wenn man wie ich sonst ungefähr ein mal pro Woche ein neues Rezept veröffentlicht, fallen die Fehler und Fehlschläge nicht auf.Da habe ich genug Zeit, etwas zu überdenken und dann zu wiederholen. Während des Vegan Month of Food hat man aber keine Zeit, etwas drei Mal zu backen. Wie diese Ochsenaugen, die total aus der Form geraten sind. Sie haben unglaublich gut geschmeckt, aber so eine traurige Marzipangarnitur will wahrscheinlich niemand nachbacken. Ein sehr gutes Beispiel dafür, dass das Veganisieren von Rezepten nicht immer so einfach klappt. Oft nimmt man einfach das vegane Äquivalent zu einem Tierprodukt und mogelt sich so durch. Oft gibt es aber gar kein angemessenes Äquivalent. Manchmal muss man daher das ganze Rezept auseinandernehmen und sich genau überlegen, welche Zutaten man wählt und nach welcher Methode man vorgeht. Ich habe mir vorgenommen, auch in den nächsten Monaten mein Vegan Month of Food Thema weiterzuführen. Da bleibt also genug Zeit, es noch einmal mit den Ochsenaugen zu versuchen. Bummer! It’s such a shame when things don’t work out, but it gives you a chance to come up with your own recipe. The ones you link to look very shortbread-like, I wonder if that’s something you could go with, mixed in with marzipan? They look delicious to me – sorry you were disappointed – egg white seems to be one of the harder elements of baking to replace in vegan baking – on the upside at least if your experiments with this recipe all are this good then I say bring on the experiments! Your failure still looks delicious! I think following your trial and error is even more interesting than it would be to get the finished perfect product. It makes you seem human :P even though we all know you are superhuman. And I’m sure you will figure out how to improve these ox eyes (such a creepy name!). I’m looking forward to reading that post! If I never looked at thay picture you linked to I would have been none the wiser, because your cookies look incredibly good! Yours look more real, kind of like a better version of a thumbprint cookie. Hope you’re able to find something that gets the marzipan to your liking. 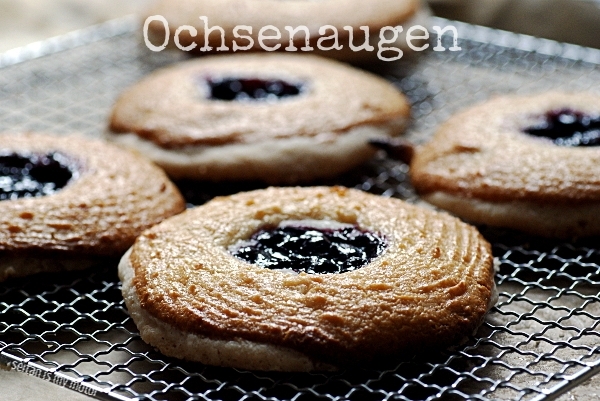 I don’t care if your Ochsenaugen don’t look exactly like they were supposed to look – to me they just look delicious! Yours look nicer than the ones with all the funky food coloring anyway. they still look pretty freakin gorgeous to me! Oh well, you can’t win ‚em all. They certainly sound amazing… and I really admire your perseverance. Try and try again! :) Good luck! Your cookies look awesome! And they look a lot more like oxen eyes than the ones in the Dr Oetker recipe (although I’d love to see oxen with eyes like that!). Re: flax meringue – There’s a thread on the PPK (in the Kitchen). If you haven’t seen it, people have been having a lot of success. I think someone made pavlova. Thanks, Rachel. I’ll check it out. Hey Mihl, I read somewhere about boiling up Flaxseeds to make a fluffy – eggwhite alternative. Would you like me to dig up the recipe? I’m not sure how well they’d work with marzipan and I don’t think you can bake them higher than 160°C but it would be worth a try? Thank you, Jess! I’ll look for that. And thanks for trying the Hefeschnecken. Your version sounds very delicious. The cookies, even though they didn’t turn out well, look super delicious. I love marzipan and jam, but sadly I live in the United States and marzipan is not very popular. For my birthday last year, my mother and I veganized a Swedish Princess cake. Thank you, Eric! That is very helpful. I’ll check it out. To someone who has never seen the original version, yours look beautiful. The photo in fact, is kind of unappetizing with all the weird colors. Ich finde, sie sehen trotzdem toll aus :-)). Versteh dich trotzdem, mir gelingt ja auch nicht immer alles ;-). It’s inevitable. Every time a really recipe fails to be veganized I am little sad, but then instantly really curious to figure it out! What a perfectionist you are! I think they look great! Love all the marzipan that German desserts seem to involve. mihl, these look awesome anyway. when i read your post i was thinking about psyllium fibre husk (as in your coconut macaroons) because flax could be too overpowering – but actually i don´t know if that marzipan layer is supposed to be crispy in the end? and fibre husk would keep it too moist? Thank you for this tip! I think I’ll try it. I actually prefer the look of yours. I think they look really appetising. I did not feel that way about the look of the Dr. Oeteker recipe. Did you try cream of tartar to stabilise? Doesn’t lemon juice stabilise too? Yeah, I know what you mean. Where did they get those crazy coloured jams? Thank you for the cream of tartar tip. I bought some at a locan US/UK store today and will try it out.